An essential and complete professional project that meets all skin and hair treatment requirements at home and at the hair salon. 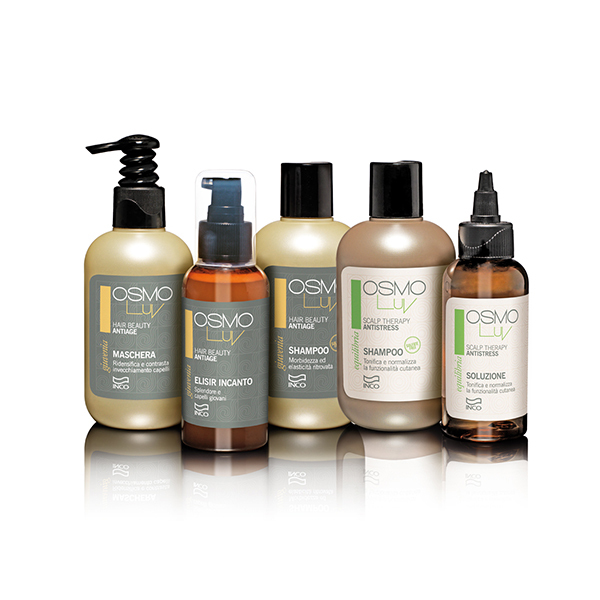 Osmoluv offers professionals the possibility of diversifying and adding new, complete services in the salon that are top quality with an ecological spirit. Radiance for timeless hair. A beauty ritual that exalts hair, a reconstruction to give youth back to “mature” hair. Body, glossy, tamed. It improves the shine, texture and softness of mature hair. A strengthening treatment that protects and repairs the effect of free radicals, pollution and U.V. rays. Sulfate free. New vitality and strength to combat the signs of hair ageing: dryness, dullness, fragility. Cosmetic treatment that brings hair back to optimal conditions. Ultra light serum that gives body to hair fibre. The active ingredients stimulated by the flat iron or hair dryer free enzymes that develop a regenerating action of the scalp to ensure stronger, more voluminous and softer hair. Nutriment to give back volume and structure to hair and ends. A combination in series of nourishing and emollient substances offering a gradual and targeted action that protects hair fibre strength, rendering it beautiful. Nourished hair, easily untangled. A protective film against ageing of the fibre, providing the hair with volume and moisturising the skin. Sulfate free. Deep down moisturisation and volume to repair dry and stressed hair, improving strength and springiness for a soft and light result. A unique mix that strengthens hair and renews its shine and softness. A cocktail of oils that restructure and strengthen to give tone and shine back to hair. A combination of proteins and marine salts that get between the hair scales increasing resistance to break. A light bath to maintain the intensity of the colour. An antioxidant complex with sun filters that create a barrier against external agents. Sulfate free. Total protection for shiny, healthy hair. A strengthening, detangling, anti-frizz product that protects from the heat of the flat iron and hair dryer, contains sun filters. Actions targeted at the roots that bring beauty down to the ends. Active ingredients that help restore the daily balance of skin stressed by numerous external agents and internal excesses. It tones and normalises skin function. Sulfate free. It helps leave hair moisturised, springy, shiny, and well balanced and protects against oxidative damage. Suitable for sensitive skins, it relaxes surface tensions with a pleasant feeling of natural freshness. Wellbeing and lightness on the scalp. It prevents and eliminates dandruff. Specific treatment to stop skin desquamation and restore normal activity. It counteracts the presence of yeasts and frees the skin of dandruff. Sulfate free. It prevents and eliminates dandruff. It sanitises and purifies the skin from continuous desquamation and any sebum excess. It enhances cellular turnover and microcirculation function. A healthy and well looked after skin taking only a few simple ritualistic applications to enter into a world of pure and relaxing “wellbeing”. Periodical cleansing of the scalp with an exfoliating action and a complete remineralisation enclosed in velvety silt collected on the banks of the Brenta River. Micronized mineral dust of the dolomite rocks gives vigour and vitality to scalp and hair. A blend of the natural essential oils of Bergamot, Orange, Coriander and Grapefruit to add to the Impacco also as a Shampoo or Mask to pamper you with moments of serenity and boost the detox action. A weekly cleansing treatment to help the skin’s cellular turnover and counteract the presence of yeasts which are the cause of dandruff. A combination of purifying active ingredients and oils for a gentle and deep down cleansing action that regulates and removes excess sebum. High moisturising action for manageable, soft and shiny hair. Mineral salts and vitamins exert anti-oxidant functions and represent the essential nourishment for regenerating the hair follicle which they reach by way of an active blood supply. Vigour and vitality from the roots to the ends. It stimulates the formation of collagen, has an exfoliating action as well as an anti-oxidant action that strengthens hair and prevents it falling. For strong and shiny hair. A head of voluminous hair is synonymous with beauty and good health. It encloses a new energy that gives strength to damaged hair and keeps frizz under control, making it shine. Thickness, vitality, springiness for fine hair and without support. Used regularly, it makes hair voluminous, soft and easy to comb. It facilitates styling up to the next shampoo. Sulfate free. A cosmetic and restructuring action to create structure, moisturise and strengthen the hair fibre. Shine, protection from damage caused by heat and humidity, antistatic action to create volume and improve styling.